As the mission statement above indicates, DeWitt Library strives to support teaching and learning at Northwestern College by providing you -- students, faculty, and staff -- with the books, journals, media, and electronic resources you need. Each year, these resources grow in both depth and breadth. We currently hold more than 80,000 books and media plus provide access to 650 print journals and over 75,000 electronic publications. The library is more than a collection of books and bytes, however; it's a place where learning occurs. Opened in 2013, the modern and beautiful building offers the spaces and technology to meet the needs of students, no matter their study styles or projects at hand. 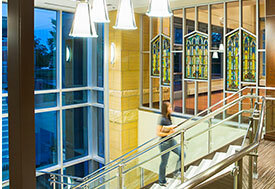 Yet the building also manages to acknowledge the college's past, even incorporating stained glass windows that highlight our faith background while acknowledging the former theatre space that these windows once graced. In addition to the glass, the building showcases 26 pieces of original art, some from the college's permanent collection. The 58,000-square-foot building includes the Vogel Community Room, a large meeting space available for both campus and public events. The room is able to be partitioned into 3 sections, each equipped with projection technologies. A nearby kitchen allows for easy catering, and the wall of windows treats guests to a lovely view of Northwestern's campus. To inquire about renting the room, please contact Northwestern's maintenance office. 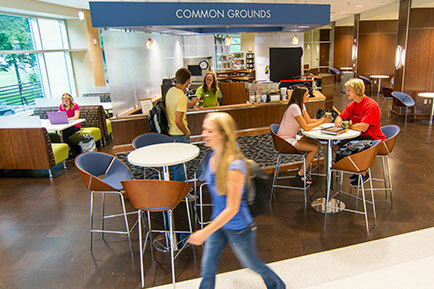 Common Grounds coffee bar, located on the first floor of DeWitt Learning Commons, offers hot and cold specialty drinks and a variety of grab-and-go food options. It's a welcoming space to study or to meet a friend for coffee. 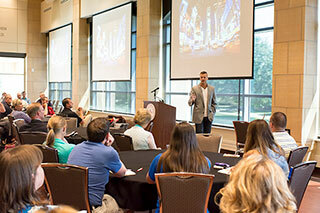 Hours of operation for Common Grounds can be found on the college's hours page.